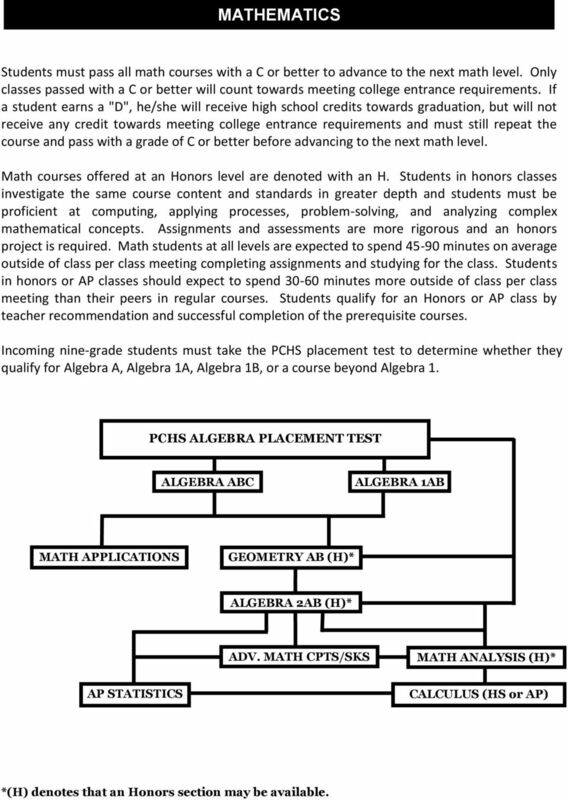 Download "PCHS ALGEBRA PLACEMENT TEST"
1 MATHEMATICS Students must pass all math courses with a C or better to advance to the next math level. Only classes passed with a C or better will count towards meeting college entrance requirements. If a student earns a "D", he/she will receive high school credits towards graduation, but will not receive any credit towards meeting college entrance requirements and must still repeat the course and pass with a grade of C or better before advancing to the next math level. 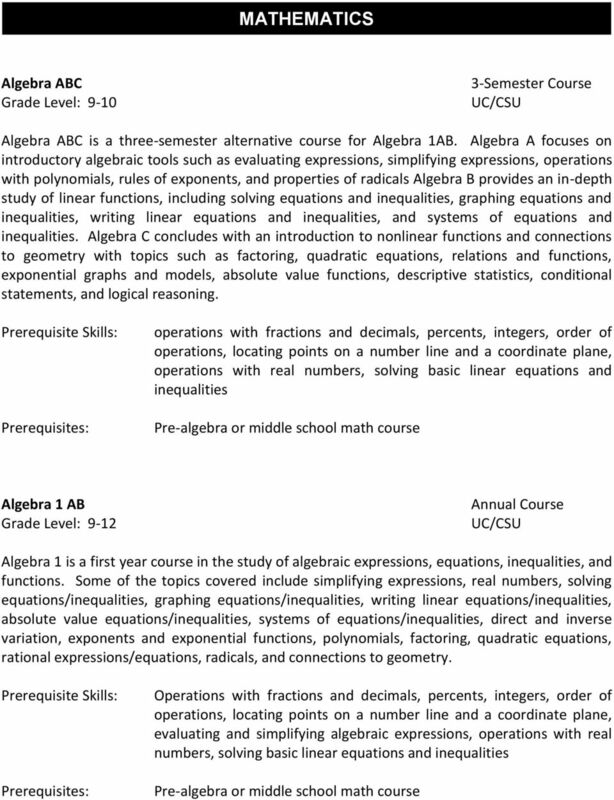 Math courses offered at an Honors level are denoted with an H. Students in honors classes investigate the same course content and standards in greater depth and students must be proficient at computing, applying processes, problem-solving, and analyzing complex mathematical concepts. Assignments and assessments are more rigorous and an honors project is required. Math students at all levels are expected to spend minutes on average outside of class per class meeting completing assignments and studying for the class. Students in honors or AP classes should expect to spend minutes more outside of class per class meeting than their peers in regular courses. Students qualify for an Honors or AP class by teacher recommendation and successful completion of the prerequisite courses. Incoming nine-grade students must take the PCHS placement test to determine whether they qualify for Algebra A, Algebra 1A, Algebra 1B, or a course beyond Algebra 1. PCHS ALGEBRA PLACEMENT TEST ALGEBRA ABC ALGEBRA 1AB MATH APPLICATIONS GEOMETRY AB (H)* ALGEBRA 2AB (H)* ADV. 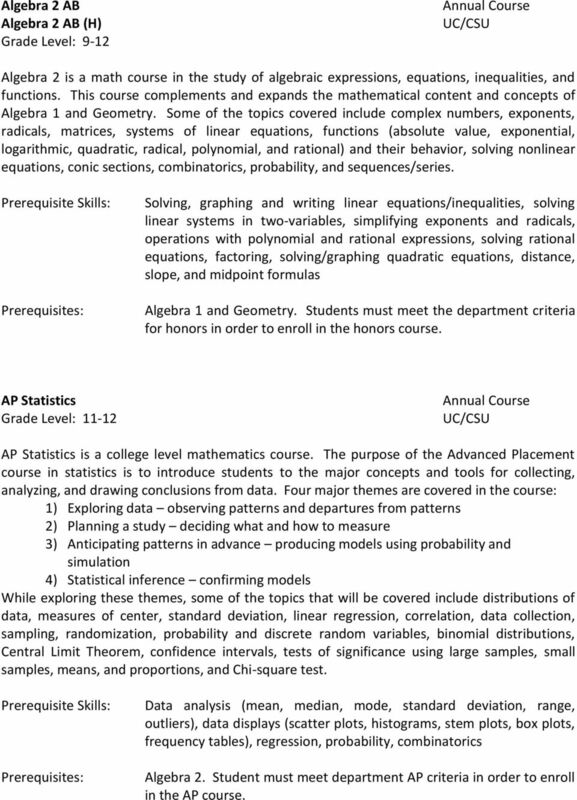 MATH CPTS/SKS MATH ANALYSIS (H)* AP STATISTICS CALCULUS (HS or AP) *(H) denotes that an Honors section may be available. 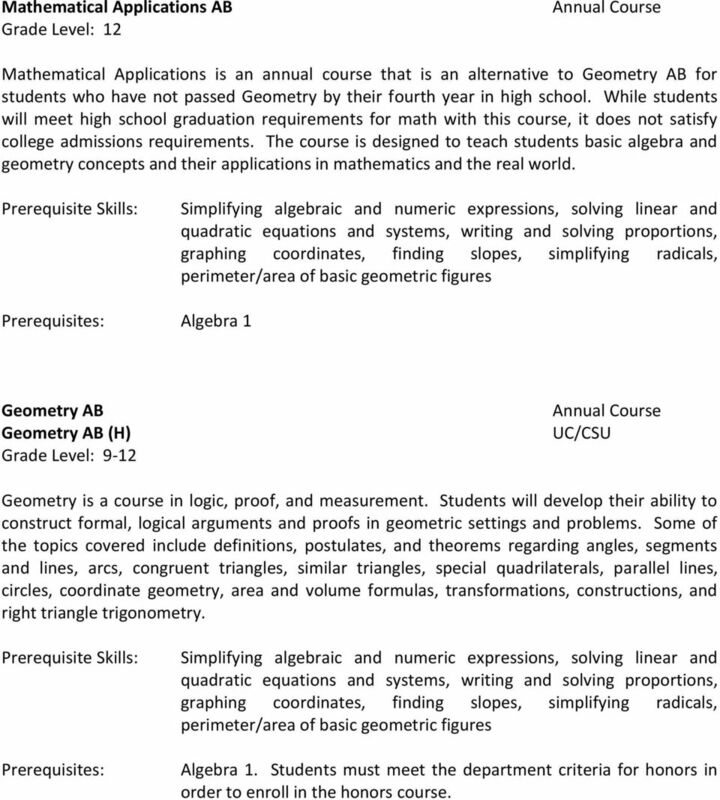 3 Mathematical Applications AB Grade Level: 12 Mathematical Applications is an annual course that is an alternative to Geometry AB for students who have not passed Geometry by their fourth year in high school. While students will meet high school graduation requirements for math with this course, it does not satisfy college admissions requirements. The course is designed to teach students basic algebra and geometry concepts and their applications in mathematics and the real world. Simplifying algebraic and numeric expressions, solving linear and quadratic equations and systems, writing and solving proportions, graphing coordinates, finding slopes, simplifying radicals, perimeter/area of basic geometric figures Algebra 1 Geometry AB Geometry AB (H) Geometry is a course in logic, proof, and measurement. Students will develop their ability to construct formal, logical arguments and proofs in geometric settings and problems. Some of the topics covered include definitions, postulates, and theorems regarding angles, segments and lines, arcs, congruent triangles, similar triangles, special quadrilaterals, parallel lines, circles, coordinate geometry, area and volume formulas, transformations, constructions, and right triangle trigonometry. Simplifying algebraic and numeric expressions, solving linear and quadratic equations and systems, writing and solving proportions, graphing coordinates, finding slopes, simplifying radicals, perimeter/area of basic geometric figures Algebra 1. Students must meet the department criteria for honors in order to enroll in the honors course. 4 Algebra 2 AB Algebra 2 AB (H) Algebra 2 is a math course in the study of algebraic expressions, equations, inequalities, and functions. This course complements and expands the mathematical content and concepts of Algebra 1 and Geometry. Some of the topics covered include complex numbers, exponents, radicals, matrices, systems of linear equations, functions (absolute value, exponential, logarithmic, quadratic, radical, polynomial, and rational) and their behavior, solving nonlinear equations, conic sections, combinatorics, probability, and sequences/series. Solving, graphing and writing linear equations/inequalities, solving linear systems in two-variables, simplifying exponents and radicals, operations with polynomial and rational expressions, solving rational equations, factoring, solving/graphing quadratic equations, distance, slope, and midpoint formulas Algebra 1 and Geometry. Students must meet the department criteria for honors in order to enroll in the honors course. AP Statistics Grade Level: AP Statistics is a college level mathematics course. The purpose of the Advanced Placement course in statistics is to introduce students to the major concepts and tools for collecting, analyzing, and drawing conclusions from data. Four major themes are covered in the course: 1) Exploring data observing patterns and departures from patterns 2) Planning a study deciding what and how to measure 3) Anticipating patterns in advance producing models using probability and simulation 4) Statistical inference confirming models While exploring these themes, some of the topics that will be covered include distributions of data, measures of center, standard deviation, linear regression, correlation, data collection, sampling, randomization, probability and discrete random variables, binomial distributions, Central Limit Theorem, confidence intervals, tests of significance using large samples, small samples, means, and proportions, and Chi-square test. Data analysis (mean, median, mode, standard deviation, range, outliers), data displays (scatter plots, histograms, stem plots, box plots, frequency tables), regression, probability, combinatorics Algebra 2. Student must meet department AP criteria in order to enroll in the AP course. 5 Advanced Mathematics Concepts/ Advanced Mathematics Skills This advanced mathematics course is a year-long survey course of advanced mathematics concepts and skills consisting of two independent semesters. The first semester introduces students to properties and applications of matrices in linear algebra and reasoning and rules that govern basic principles of logic and set theory. Students will also further investigate and study the behavior and characteristics of non-linear functions first introduced in Algebra 2. The second semester will include basic trigonometric concepts involving the unit circle, graphs of trigonometric functions, trigonometric equations, and trigonometric identities. Lastly, students will explore data collection and analysis in a unit on statistics and probability. In short, this course will expose students to advanced math concepts and skills in Functions, Algebra, Statistics, and Trigonometry. 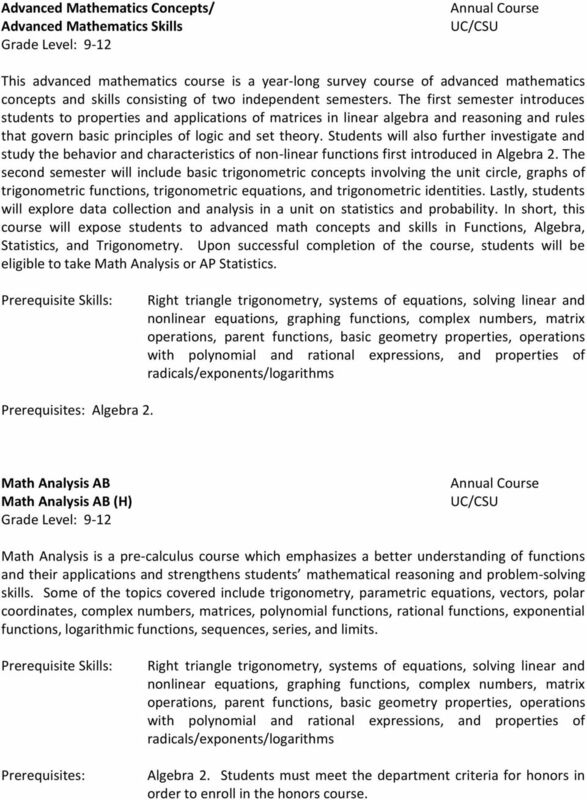 Upon successful completion of the course, students will be eligible to take Math Analysis or AP Statistics. Right triangle trigonometry, systems of equations, solving linear and nonlinear equations, graphing functions, complex numbers, matrix operations, parent functions, basic geometry properties, operations with polynomial and rational expressions, and properties of radicals/exponents/logarithms Algebra 2. Math Analysis AB Math Analysis AB (H) Math Analysis is a pre-calculus course which emphasizes a better understanding of functions and their applications and strengthens students mathematical reasoning and problem-solving skills. Some of the topics covered include trigonometry, parametric equations, vectors, polar coordinates, complex numbers, matrices, polynomial functions, rational functions, exponential functions, logarithmic functions, sequences, series, and limits. Right triangle trigonometry, systems of equations, solving linear and nonlinear equations, graphing functions, complex numbers, matrix operations, parent functions, basic geometry properties, operations with polynomial and rational expressions, and properties of radicals/exponents/logarithms Algebra 2. Students must meet the department criteria for honors in order to enroll in the honors course. 6 HS Calculus AB High School Calculus is a first year calculus course. Some of the topics covered include limits, continuity, derivatives, applications of derivatives (related rates, curve-sketching, optimization), integrals, applications of integrals (volumes, accumulation of change, differential equations), and techniques of integration. Trigonometry, linear and nonlinear equations and systems, piecewise functions, elementary functions (equations, graphs, and behavior), transformations of parent functions, basic geometry properties, operations with polynomial and rational expressions, and properties of radicals/exponents/logarithms Math Analysis AND teacher recommendation AP Calculus AB AP Calculus BC AP Calculus AB is a challenging in-depth study of functions, graphs, limits, derivatives, definite integrals, antiderivatives, and real-world applications of differentiation and integration. Students will work with functions graphically, numerically, analytically, and verbally and understand the connections among these representations. Some of the topics covered include limits, continuity, derivatives, applications of derivatives (rates of change, rectilinear motion, related rates, curve-sketching, optimization), integrals, applications of integrals (area, volumes, accumulation of change, differential equations), and techniques of integration. 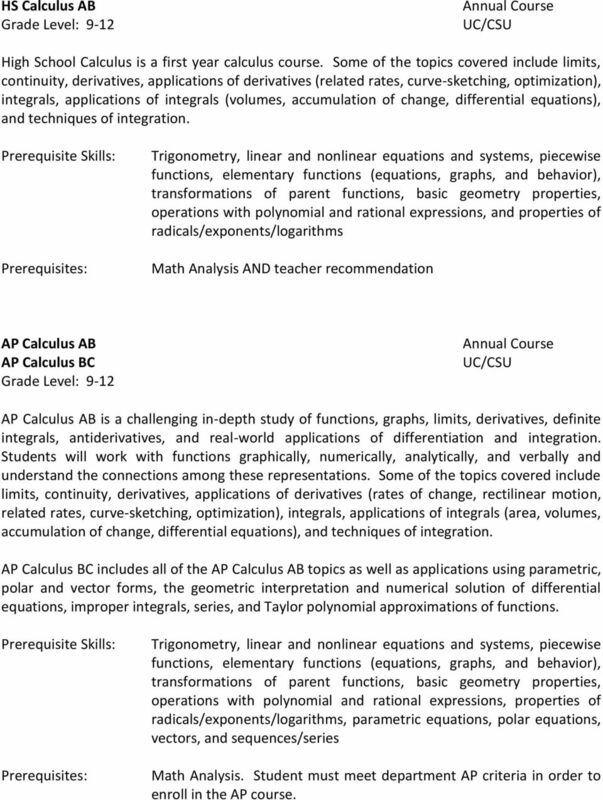 AP Calculus BC includes all of the AP Calculus AB topics as well as applications using parametric, polar and vector forms, the geometric interpretation and numerical solution of differential equations, improper integrals, series, and Taylor polynomial approximations of functions. Trigonometry, linear and nonlinear equations and systems, piecewise functions, elementary functions (equations, graphs, and behavior), transformations of parent functions, basic geometry properties, operations with polynomial and rational expressions, properties of radicals/exponents/logarithms, parametric equations, polar equations, vectors, and sequences/series Math Analysis. Student must meet department AP criteria in order to enroll in the AP course. MATHEMATICS MATHEMATICS 1 443 This course stresses the development of arithmetic skills and emphasizes concepts as well as computation. Proficiency is developed with each of the fundamental operations. Algebra I. Copyright 2014 Fuel Education LLC. All rights reserved. CHAMBERSBURG AREA SCHOOL DISTRICT COURSE OF PLANNED INSTRUCTION SCHOOL CASHS DEPARTMENT MATH DATE 7/12/05 COURSE TITLE ALGEBRA I GRADE 8-12 COURSE LENGTH 1 YR. LESSON FREQUENCY (PER WEEK) 5 TIME 43 MIN. Math Placement Test Sample Problems The Math Placement Test is an untimed, multiple-choice, computer-based test. The test is composed of four sections: pre-algebra, algebra, college algebra, and trigonometry. Math Basics K-12. Number Sense Students will be able to write, identify, match and count numbers to 20 and compose/decompose numbers 1 through 20. MATHEMATICS Administered by the Department of Mathematical and Computing Sciences within the College of Arts and Sciences. Paul Feit, PhD Dr. Paul Feit is Professor of Mathematics and Coordinator for Mathematics. SEMESTER PLANS FOR MATH COURSES, FOR MAJORS OUTSIDE MATH.